Alberta has partnered with Athabasca Chipewyan First Nation to help reduce greenhouse gas emissions, increase energy efficiency and lower utility expenses. L-R: Coun. Raymond Cardinal, Athabasca Chipewyan First Nation, Chief Allan Adam, Athabasca Chipewyan First Nation, Minister Feehan, Coun. Michele Voyageur, Athabasca Chipewyan First Nation and workers from the project. With support from Alberta’s Indigenous Energy Efficiency (Retrofit) Program, a new local grocery store and six much-needed family homes will be built with upgraded energy-efficiency features. These features will prevent up to 90 tonnes of greenhouse gases from entering the atmosphere each year and save the community up to an average of 25 per cent in electricity and heating costs per year over the next 25 years. As a result of the grant, the new grocery store will have LED lighting, better insulation and a high-efficiency refrigeration system that will recycle heat back into the building. The new homes will have spray foam insulation, high-quality windows and doors, programmable thermostats, low-flow plumbing and Energy Star appliances. Alberta’s Indigenous Energy Efficiency (Retrofit) Program is a new provincial grant initiative to help Indigenous communities reduce their energy expenses and reduce greenhouse gases. 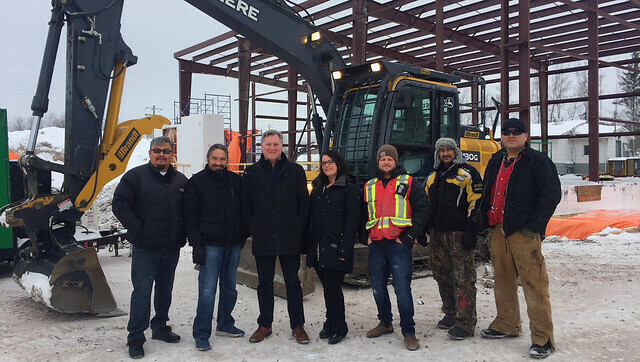 Athabasca Chipewyan First Nation is one of many Indigenous communities and organizations that will become more energy-efficient with support from the program. The $636,460 grant is part of $35 million in funding available this fiscal year through various streams, including the Alberta Indigenous Energy Efficiency (Retrofit) Program, to meet the needs of Indigenous communities tackling climate change. Panel discussions, dialogue with Indigenous leaders, workshops and feedback from two successful pilot programs helped inform the development of the program.